It was a pleasant winter afternoon when we arrived at the famed blackbuck area of Ganjam. We eagerly got down from the vehicle and started walking towards the fields that surround the Aska –Balipadar state highway. Rocky hills bereft of vegetation, save the occasional thorny bamboo bush bordered vast grassland. We saw the occasional patch of urad dal. A few scattered thin trees loomed in the distance, solitary sentinels in the vast open lands. As some crop fields were used for paddy farming during the monsoon, the farmers had built huge bunds to retain rain water in the undulating landscape. Amulya Kumar Upadhaya, who leads the local conservation group of Bhetnoi village, raised his hand and scanned the horizon. Finally, he found a group grazing peacefully beyond a field that was about 300 metres away. We had not seen the herd since the earthen embankment had blocked our view. As we approached them, they did not seem scared but continued grazing. Anxiously, we clicked some photographs and continued our walk. Suddenly, the lone male, who was grazing contentedly, looked up. He was staring straight at us with his striking black and white face crowned by the magnificent corkscrew pair of horns. He gave the alarm signal and the herd comprising of drab females with the male leader took flight. They fled rapidly, with their unimaginably long jumps; covering almost 20 feet in one go! We marveled at their lithe bodies as they shot forward like arrows fired from a taut bow! The blackbuck of Odisha’s Ganjam district are protected by local villagers. It is the most successful case of community conservation of wildlife in Odisha. From a meagre population of around 573 in 1990, the census of 2018 revealed an estimated 4,044 blackbuck, including spill -over populations in the adjacent Khurda and Nayagarh districts. The locals revere them as more than a century ago, a spell of severe drought was broken after a few blackbuck suddenly appeared there. British records of the late nineteenth century observe that blackbuck occurred in most places of Odisha from Midnapore in Bengal to the current-day state of Andhra Pradesh. However, extensive hunting and loss of habitat to cultivation had led to a sharp decline. More than a hundred years ago, the British banned killing of blackbuck in Ganjam district. Now the species is protected under Schedule I to the Wildlife (Protection) Act,1972. Blackbuck find a treasured place in ancient Indian paintings and culture, being referred to in several Sanskrit texts and were said to draw Lord Krishna’s chariot. Mughal miniature paintings have depicted blackbuck hunts with the aid of tame cheetahs. The hide was considered sacred and used by sages as a seat. The recent case of conviction of Bollywood actor Salman Khan for poaching blackbuck in Rajasthan catapulted the species to international fame. It is heartening to note that despite huge losses of crop due to depredation by the antelope, the farmers continue to tolerate them. Now, blackbuck are seen in and around 70 villages. As they extend their habitat due to growing populations, they are now seen in new areas. Males are possessive of the females in their own group and drive away competitors. Fierce fights lead to injuries. Hence, young males are in search of new territories. Lone males often try to entice females from herds for mating. 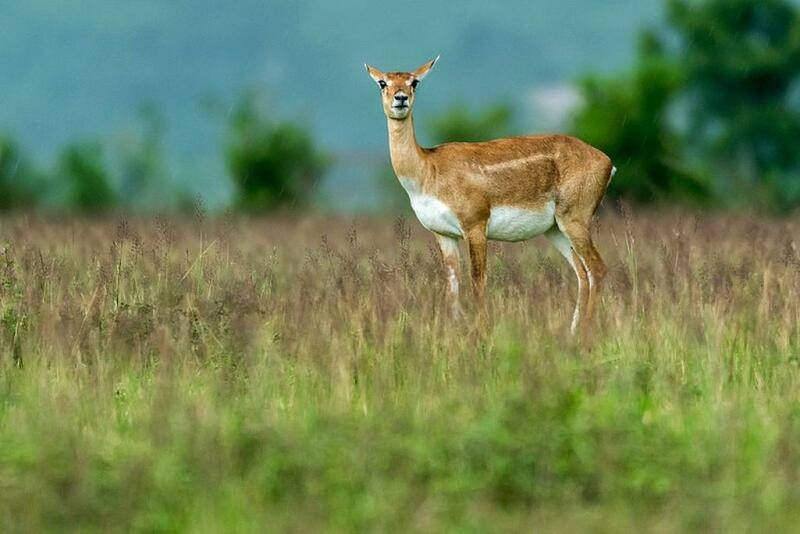 The Odisha Forest Department plans to re-introduce blackbuck in Chandaka and Konark- Balukhand wildlife sanctuaries (WLS). I think it is a terrible idea which would not help the blackbuck in any way. Yes, they used to roam these areas in the past, when there were vast open spaces with little farming or human presence. Chandaka WLS is now covered with teak and bamboo plantations without grasslands. Will they survive here? Similarly, there are huge changes in and around the erstwhile coastal forests of Konark-Balukhand WLS. Apart from a few scattered meadows of 2-3 acres, there are no vast open grasslands. They are now covered with thick plantations of cashew and casuarinas, which give no scope to the antelope to sprint and escape predators or hunters. The surrounding villagers are not like the Ganjam community. They may hunt them down if they eat crops. About three decades ago, the forest department had released 14 captive bred blackbuck at Bhitarkanika, all of whom had died, unable to adapt to the local landscape. I hope sense prevails and this experiment is not repeated. The forest department needs to respect the efforts of the local community of Ganjam and provide assistance. A good crop compensation scheme would alleviate the suffering of the impoverished farmer who loses his crop. Though the rules provide for payment of compensation, affected farmers are yet to be made aware of these rules. At present, protection is dismal in most sanctuaries of Odisha, where you cannot even spot any wildlife. The Ganjam story stands out as a brilliant example of a successful community-based protection system which should be replicated by the state government.